In 2007 Takashi Murakami’s 727 was sold for over 80 million yen, rendering him the most expensive contemporary artist in Japan. In 727 series we see a variegated, pointed-teethed Dob riding on a richly ornamented wave, inexplicably cute and somewhat grotesque. The title 727 derives from a shampoo brand “727COSMETICS” the artist saw while traveling on Shinkansen. Initially he thought the name had something to do with Boeing 727 but later found out that it was actually the brand founder’s wife’s birthday. 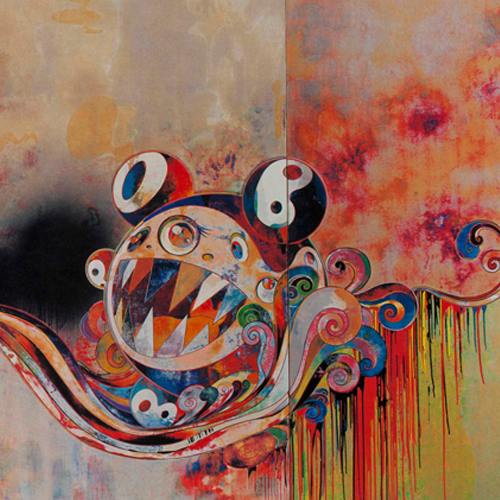 Takashi Murakami later named the artwork with his “misunderstanding” and actually adapted various techniques and created several versions catering to collectors’ requirements. The artwork bears a resemblance of a three fold screen and shows a strong similarity of Japanese Ukiyo-e woodblock. Mr. DOB, the whimsical, sharp-toothed character riding the wave at center, is Murakami's first signature creation inspired by the anime (animated film) and manga (comic book) characters that have achieved cult status in Japanese youth culture. His name is a contraction of the Japanese slang __EXPRESSION__ "dobojite," or "why?" and it is literally spelled out in his facial features and appendages, ensuring we recognize him in spite of his ever-changing appearance. Here Mr. DOB is borne on a tide of traditional Japanese forms. The wave, spanning the length of three panels that evoke a painted folding screen, is strongly suggestive of the well-known woodblock prints of the Japanese artist Hokusai (1760–1849). About twenty layers of paint, resembling lacquer, were builtup then scraped away to create a variegated abstract background in Nihonga style, a fusion of Japanese and Western artistic approaches that developed in the late nineteenth century. Of 727 Murakami has said, "The work is not particularly representative of anything. It is simply a combination of all the available techniques that I had at the time."